AutoMate AM-50/75 semi automatic induction sealers are the right choice for research and development and small volume runs. With two models available producing 500 or 750 Watts of power the units produces a strong field in a very compact package. The AM-50/75 can accomodate caps from 5mm up to 100mm in diameter. Missing foil detector with audible and visual alarms (can be operator activated and deactivated). One specially designed proprietary sealing head accommodates up to 100mm caps (no need to purchase extra sealing heads). No sealing head cores to buy. LED display screen with touch buttons for easy use (no old style thumb wheels or dials. Patented stainless steel tool-less sealing head height adjustment with incremental scale for accurate set-up and repeatability. Eliminates the need to hold the sealing head. Sealing head is automatically supported parallel to the cap to provide the optimum seal. Advanced state of the art microprocessor controlled circuitry delivers high efficiency sealing power and long term reliability. Hands-free design ensures accurate fast, reliable sealing and eliminates operator fatigue. ……SIMPLY STATED, THIS IS THE BEST, MOST ADVANCED HANDS-FREE SEALER AVAILABLE!! Portable field strength meter Model AM-CSM-4 Can accurately measure the field strength of an induction sealer. A necessity for proper validation and documentation. This meter assists in verifying that the cap sealer is producing the same repeatable sealing field every time assuring a consistent power output. See separate brochure for more details. Comes complete with carrying case. 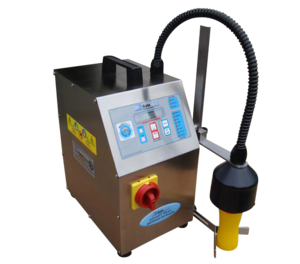 AutoMate AM-50/75 semi-automatic induction sealer is the right choice for research and development and small volume runs.